Posted: Wed May 20 15 10:48 pm Post subject: Fire box dividers??? Does anyone run the Fire box dividers??? What works better....solid box with open bottom or open all around??? Are you talking about a charcoal basket??? I've always meshed the sides and bottom. I don't have a reason for it other than thinking that more access to air the better considering possible ash build up. So........Do you use dividers in your charcoal box??? Are they worth the trouble??? If you want to run a charcoal maze through your charcoal basket then it's worth doing, you need 3/4 - 1" spacing between the walls of a maze, or you will get heat jump. By working with a maze, you can often get as long as 3.5 - 4 hours before you need to refill and some folks learn to refill just before they loose the existing coals and then get a back burn through the maze. If you are running more of a wood fire than a charcoal one, then a maze is not really going to help out that much. 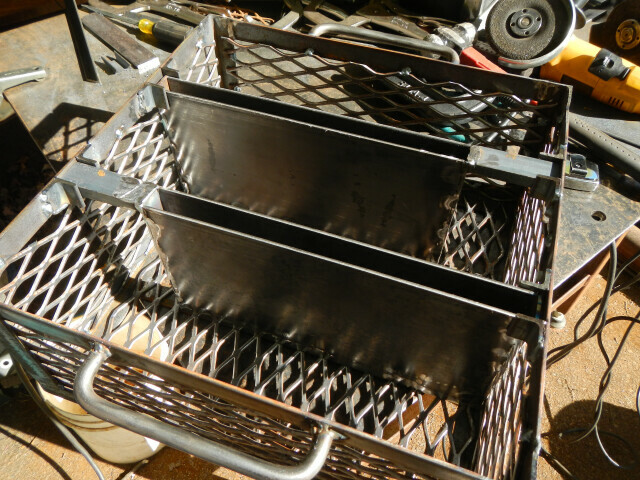 I use a coal basket with a Vee I made that looks like a fireplace grate. I tried the dividers in my basket and didn't get any gain from them. My cooker ended up being a fuel hog and either way I went I got 2-1/2 to 3 hour burn per basket. I think the guys running UDS's get better results and much slower burn times. YMMV. Here's the basket per SoEzzy's specs. My baskets internal dimensions are 17" x 15" x 8". I also plan on running a stoker on this particular cooker. Here is a pic of my set up. KAM, I was thinking about doing something similar to this, do you feel like it helps? My fire box is 24" pipe, sometimes when a split burns down, my coal base spreads out and I feel like I lose some efficiency. Not really having major problems, but I'm always looking for things to tweak. I love the way it contains my coals and keeps my coal base compact instead of spreading around. K.A.M. , that V configuration on the firebox. It still working out best or have you found a better method? I am using it on both my cookers and love it. To date I have not found a better method for my needs.